The finding has significant implications at a time when schools are moving to the Common Core curriculum, which shifts math instruction from more number based to more word based. The findings also tie in with the national focus on Science Technology Engineering Mathematics (STEM) education because children who encounter difficulty with math at an early age often get turned off by the subject. English language learners are the fastest growing demographic segment in U.S. public schools, with an estimated 11.2 million students enrolled, according to U.S. Department of Education statistics. Spanish-speaking English language learners make up 73 percent of that number and represent a substantial number of students who do not demonstrate proficiency in math. Only nine percent of white fourth-grade students scored "below basic" in math skills, while 42 percent of English language learner fourth graders did, according to The Nations Report Card, which is compiled by the U.S. Department of Education. By eighth grade, the gap widens, with 17 percent of white students scoring "below basic" and 72 percent of English language learners students scoring at the same level. The situation is further complicated by the fact that No Child Left Behind, the 2001 federal standards-based education reform act, was more focused on improving reading, not math, said Michael Orosco, the assistant professor at UC Riverside who wrote a paper about his findings. It is published in the Feb. 2014 issue of the journal "Learning Disability Quarterly." As a result of that focus on reading, there is gap in professional development for teaching math, Orosco said. Orosco is one of only a few researchers in the country studying the importance of reading and language in learning math among non-native English speakers. 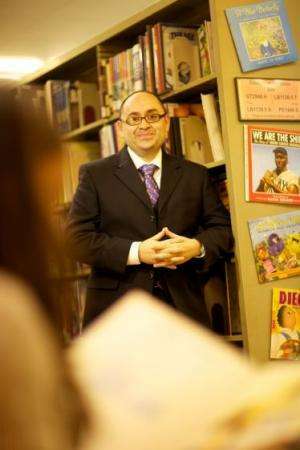 His past research has focused on improving reading comprehension of Latino English language learners in elementary school, an area that strikes a personal tone – his mother had only a sixth-grade education and his father was illiterate. He said his current focus on math stems from his days in the early 2000s struggling to teach the subject to sixth graders in Longmont, Colo. The findings outlined in the Learning Disability Quarterly paper are the result of research conducted in an elementary school in the San Bernardino Unified School District in California. The school can't be named because of a confidentiality agreement. Students who took part in the study that is outlined in the "Learning Disability Quarterly" paper received the standard 50 minutes of math per day, and an additional 17, 20- to 25-minute sessions over a five-week period. During those extra sessions, word problems were modified based on four math language levels. Level one word problems used math terminology found in everyday language, including words such as before, more and combine. Levels two words include addition, factor and sum. Level three includes quotient and denominator. Level four includes perimeter, cylinder and triangle. All the students started the study with a level one baseline. By the end of the 17 sessions, all were at level three or four. "The key is reaching the students early," Orosco said. "It's a building block. "If they don't get the language and reading when they are young, by the time they get to middle school they are going to be lost in math class." The study is limited by the fact that it only measured changes in six third-grade Latino English language learners. However, similar positive results were found in another published paper written by Orosco that focused on second-grade English Language learners who were being instructed in English. Also, two forthcoming papers that focused on second- and third-grade students who were instructed in Spanish outline similar findings.